Elizabeth Brown believes that we all have a deep desire to give and we are at our best, individually and collectively, when we harness generosity and channel it towards inspired change. 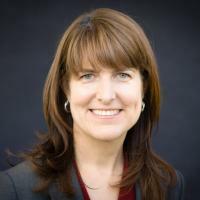 Beth brings 25 years of experience in philanthropy to her role as President and CEO of Community Foundation Sonoma County, turning donors into grantmakers and bringing the nonprofit community together to drive innovation. Beth previously served in leadership roles at the Marin Community Foundation and the Council on Foundations in Washington, D.C., and as a philanthropic advisor at US Trust. She is a recent winner of the North Bay Business Journal’s Nonprofit Leadership Award. Beth is originally from Atlanta, GA and received her BA in Political Science from Davidson College and MA in Writing from The Johns Hopkins University. When Beth is not plotting the best possible future for Sonoma County alongside donors, nonprofit leaders or her amazing foundation staff, you can find her practicing yoga and hiking with her fiancé in Sonoma County’s regional parks.